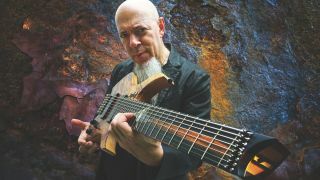 “I’m always creating... that’s just my life,” says Dream Theater keyboard legend Jordan Rudess who, along with releasing the prog titans’ 14th studio album in February, has also been putting finishing touches to latest solo effort, Wired For Madness. You could say he’s had his hands full over the last year or two. “That was my first album with Dream Theater, now 20 years ago, so this tour we’re doing is not only the anniversary of that album but my joining… that feels very special and cool. “For a lot of people, that’s their favourite Dream Theater album. It’s a great time for this band, the new album has been greatly received - it’s a nice return to the harder core sound, especially after going in another creative direction on The Astonishing. As we all know, that was a little polarizing because not every fan could understand or relate to it. I think we confused our metal fans a bit with that album; they weren’t used to all this sensitive loveliness, haha! Your new album Wired For Madness arrives only two months after Dream Theater’s Distance Over Time. How hard was it working on two records simultaneously? “This album was a long time coming because I get so busy doing all my other important things. I had to find a nice window of opportunity to do this, because it’s such a big project. My last album was a piano album, which was very special to me but easier to pull off. There weren’t too many guests; it was very clear and simple. You’re also playing guitar on this album... which might surprise people! “I know, what the hell, right?! I’ve always played the guitar, though nowhere near as extensively as I have played the keyboards. “I met this wonderful luthier called Przemek Drużkowski, who builds great guitars. He felt inspired to build me a custom guitar and I expressed an interest in an eight-string called The Wizard. It was awesome, so I had to learn how to play it. That was right around the time of Wired For Madness, so it ended up on some tracks there as well. “It’s a lot to get your fingers around; the first time felt a bit like, ‘Whoooa!’ To go from not practising the guitar much at all to trying an eight-string was definitely intense. It took a while to wrap my head around. “It’s one of the blessings in my life that I’ve been able to work with such amazing musicians, who are also very nice people as well. My partnership with John goes back a long way; we started working together in Liquid Tension Experiment. “There have been so many years of playing unison lines, harmonies and writing together - it’s been a really mutual thing. We enjoy and learn from each other. I have certain strengths he doesn’t have and it works the other way round too, so we push each other. And you probably think more in terms of intervals? “Meanwhile, in my world, I’m thinking in terms of pitches. The keyboard isn’t about shapes; because it’s different keys, it’s not the same shape. So I think about the notes; he might think about the fretboard and together we push to do different things. It’s been inspiring to work together like that. “John Petrucci plays on the title track. I’m a big fan of The Aristocrats and Marco Minnemann is on this album, too. I love Guthrie’s playing; he’s a really nice guy and he played on my orchestral Explorations album as well. Whenever he’s available to do something, he’s pretty much up there with my first choices. “Vinnie Moore is on there, he’s an incredible player. Joe Bonamassa is on the album, too; I have this proggy blues track called Just Can’t Win, so he was kind enough to offer his abilities to that track - which also has a full brass ensemble. He’s a very tasteful player, so I’m very happy with the guests on this album. What tips can you offer someone hoping to apply their skills on string instruments to ebony and ivory? “The biggest obstacle I’d say is getting out of that idea that one shape will be the same in every key. That’s the problem. You will need to know the theory behind things, the half-steps and whole-steps scales are made of. “It’s more physical in that every scale and key will have different fingerings… there are definitely some that are the same, like the C Major scale and D major have basically the same fingerings, but you might have a different mixture of black notes and white notes. It’s takes a while to retranslate that knowledge to something laid out in a different way. “Obviously, the Dream Theater catalogue is pretty challenging in general… although there are a few ballads, like Vacant, which could be good for those who aren’t advanced players to look at and get their heads around. “I also have an online school at JROC.US with hundreds of exercises for every level. That’s a great place to go to for videos, tips, notation, MIDI files, just a whole lot of information. “Anyone looking to learn the piano should find someone to sit down with them. It’s such physical instrument; you don’t want to learn it wrong and end up with tendonitis or anything like that. Don’t play games with that kind of stuff - it can really ruin the fun. “There’s a lot on YouTube these days, slowing stuff down and learning it, but the problem is there is no one watching what you are doing - how your wrists move or if you tense up; you need some instruction to learn the instrument effectively without injury. “With the apps, I wanted to create things on devices we all have in our pockets that can change how we think about music and help add expressive ideas into our lives. I also want people who wouldn’t normally make music to get into creating. Wired For Madness is out on 19 April via Music Theories Recordings / Mascot Label Group.